The game challenges players to help Om Nom retrieve his stolen candy from an evil spider wizard. 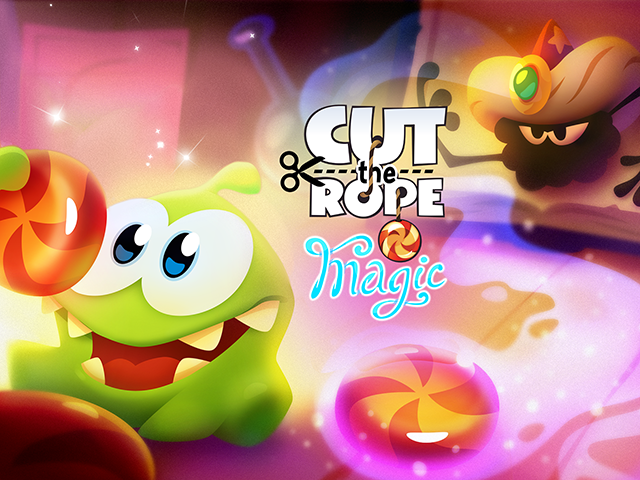 ZeptoLab has announced the release of Cut the Rope: Magic, the newest installment in its popular Cut the Rope franchise. The puzzle game takes players into a magical spell book, and challenges them to help Om Nom retrieve his stolen candy from an evil spider wizard. In each level of Cut the Rope: Magic, players are challenged to lead a piece of candy to Om Nom by cutting strings, using air pumps and more to move the candy around the screen. In keeping with the game’s magical theme, players can also transform Om Nom into five different forms to complete levels. For instance, players can turn Om Nom into a bird, which sends him into the air, and may allow users to collect a star or catch the candy, as examples. As players progress, they’ll be able to turn Om Nom into a baby, fish, mouse and spirit, each with a different ability. While players can advance through stages by collecting the piece of candy in each level, users can also collect the three stars in each stage to earn rewards like premium Magic Crystals. Players must collect the required number of stars to unlock each new level set as they progress, or spend Magic Crystals to unlock these levels instantly. In addition, players can spend real money on level solutions, which guide them through the step-by-step process of completing a chosen stage. The Cut the Rope series is now more than five years old—almost ancient in mobile gaming years. When we started in 2010, we had no idea we’d have such a long story and that Om Nom would become so popular across the world. Today, a little over five years after the first game launched, we continue to bring new ideas to the market to create something that is truly new and magical, like Cut the Rope: Magic. Cut the Rope: Magic is now available to download for $0.99 on the iTunes App Store, and for free on Google Play and the Amazon Appstore. The game is part of Amazon Underground, which gives Android and Amazon users access to free games and in-app purchases.